Develop a year round bar program for your team using these five important skills. 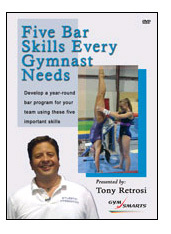 Tony Retrosis, Five Bar Skills Every Gymnast Needs, covers everything a coach or gymnastic program needs to develop a strong bar program. The skills covered are: the kip, casting to handstand, clear hip to handstand, flyaways and giants. He also includes a tremendous amount of information on pirouettes. Tony explains how to teach these skills, how he integrates them into war-up sequences, floor bar work out and how he creates a year long bar training plan. 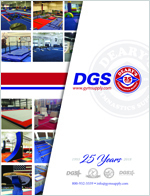 His explanations are clear and the DVD contains excellent demonstrations from his gymnasts. This is an excellent video for any club or program.